I've had this comforter for a full New England winter and it's been great. Was delivered in a nice zipped bag, although putting it away may prove difficult. So far it has stayed nice and fluffy and I report no shuffling of the filling. I like sleeping in a cool bedroom (~68 degrees) and this keeps me toasty. Wrap yourself in the fluffy warmth of this Eddie Bauer white down comforter. The comforter is crafted from 300 thread count cotton with a subtle, white damask stripe pattern that brings a hint of traditional elegance to the design. The comforter is stuffed with 600 fill power white down fill to provide medium warmth comfort to your bedroom decor. I bought my first one to furnish our new home a few weeks ago based on the comment. It turns out an amazing purchase with superior hotel quality and even lighter in weight than hotel down comforters because this one is all down, no feathers at all. It is very quiet at night unlike the feather comforters, and airy while keeping you warm in bed. It's also quite fluffy so it really compliments any nicely colored duvet covers and make you feel like sleeping in a beautiful cloud! I ended up buying 2 more (so I bought a total of 3 of these) for our other guest bedrooms. Eddie Bauer does not dissapoint! I had down coat from Eddie Bauer and this is just like the down coat, filled with very clean down material, with no smell at all. I wish I could give more stars to this product! I was worried that 600 fill power would be too hot for south Louisiana but I'm so glad I went ahead and purchased this particular one! Very fluffy, not heavy and very warm!! Especially with the unusually cold weather we've been having this January! Was fluffy after one "pop" and placed on my bed. Bought a duvet and it fits perfectly in the queen size 90"x 90" duvet. Has not lost any down and husband loves the fact that it doesn't crush our feet like a regular comforter or quilt! I would highly recommend this Eddie Bauer 600 fill power! Love it. it is not very heavy so can be used year round. During winter, i add another blanket underneath and it is perfect. It is white and not off-white and goes with every color. Very nice down filled comforter! I bought the queen size. The down fill is evenly distributed and it's a generous portion. The comforter is good quality and is perfect for cold nights. A good value in a medium warmth comforter. This is an excellent down comforter. The fill is substantial, fabric very durable and down stays in place through the night with no problems. I have had many down comforters throughout the years and this by far is one of the best ever. excellent product, great price. I would highly recommend this to anyone looking for warmth, quality, good price, and fill that doesn't move all over. I actually will be purchasing another one for my other daughters room as while it is warm it does not overheat. Very nice, good quality comforter. It's advertised as "medium warmth" but I think it provides "high warmth." We no longer have to use an extra blanket in addition to the comforter in the winter. It is very cozy and soft too. Highly recommended and great pricing too. save yourself the headache, it's hardly a medium warmth comforter its thinner than a light warmth quilt and barely filled at all. 600 fill power was misleading. worse part is they want me to have to pay *** to send it all back. dont do it to yourself dont waste your time. It took me a while to find the perfect down comforter and I'm so glad I waited and read the reviews. It's soft, full and fluffy so it fills out my duvet perfectly. It's also warm so I can use it year round. so far so good, light and fluffy, no feathers, medium weight. 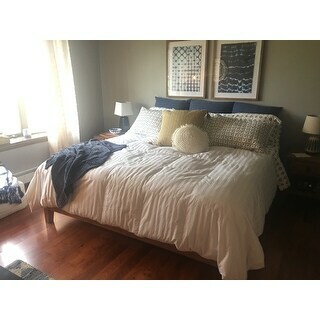 we will update review after we wash it but seems like great quality and white stripes looks very attractive even without duvet cover. This is a great comforter. I reviewed so many on the website and got frustrated. I wasn't sure what I wanted after seeing so many and reading reviews. So I finally took a shot on this one and we couldn't be happier. Very light. Very warm. Very soft. Great size. Everything we wanted. If you are unsure which one to buy, this is the one. We are extremely satisfied. Beautiful duvet, can be used all year. Nice loft. Highly recommend ! Super pleased with this down comforter! It’s the perfect amount of fluffy I was looking for. Shopped around quite a bit and overstock hands down has the best deals out there! I like the size (90x90) but it was difficult to find a matching size duvet cover. It has just gotten a little cool and I was cold for quite some time son need to get a warmer one and use this for Spring/Summer. The price was great; I saw it on another website for $100 more (on sale!). It is warm but the comforter itself doesn't feel very high end. I have had down comforters in the past that were much more plush and soft. Maybe it needs to be a higher thread count? Overall I just wasn't that impressed, and went right back to using my ten year old stained down comforter instead. Fluffy and quite warm. Quality is good. We use the comforter under our quilt for winter and it is a perfect weight. We may not need need the comforter during the summer months but its been great to get through the winter. 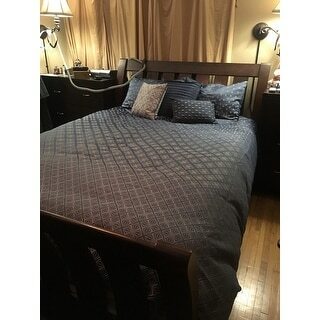 I’ve purchase this once before in a queen size over a year ago. We recently upgraded to a king bed and I purchased this comforter again. It is seriously the best comforter I’ve owned and I’ll continue to purchase as long as they’re available, if I need to replace. My year old queen one was still in excellent condition. It got so soft with each wash and it was truly enjoyable to crawl into bed and cover with it. Not too hot or too cold and I’m a very hot sleeper. My mom asked me for my old comforter because she thought it was such a great comforter. Worth every cent. This is a great comforter and not too heavy in weight. Perfect for winter weather and keeping warm. Before adding this beauty to our bed I stayed cold!!! And now I barely turn on my space heater anymore. I would definitely buy this again. It's pattern is as seen on the picture, it takes no time to warm you up and its sooooo FLUFFY!!! Super comfortable! Warm without making you sweat at night. Light, fluffy, and snuggly! I can’t express how much I love this comforter. With so many options it’s hard to know which one to invest in. I trusted the Eddie Bauer brand which has always meant quality to me and I am so glad I did. I’ve had this comforter about a year and it’s still perfect. It’s so fluffy and thick but very light weight. It’s like sleeping in a marshmallow. I came back to order one for my daughter and I’m sad to see they don’t have it in full or twin size. Not too warm but just right. Does great for the temperate weather here in Savannah, GA. If you're looking for a comforter that you won't burn up in during the summer then this is a great choice. "I sleep hot. Will these be too much for the summer months?" This would be a warmer comforter. If you use the AC to keep it cold in your house this would be fine. However, this would be better for fall or winter. "Hope someone can tell me a good way to wash this. I don’t want to cause any damage because I love it so much. Just throw it in a top loader or front loader? Mine is king size so don’t think my home washer could handle it. Please advise. TIA"
I washed mine on gentle and it worked fine...I was very nervous about doing so at first. We have a front loader and it washed fine. good luck! "My Bed is Queen size, but I am wondering if I purchase King, that it would come down more on the edges, so I don't need to use a dust ruffle, or pillow shames"
Howdy! 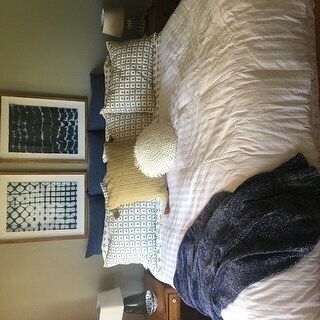 We're using King comforters on our new Queen Saavta mattress (purchased from overstock.com). A matter of taste, but I love the lush look & feel of our bed. In our config. our toppers reach just to base of mattress.You can always switch later on anyway, if you like. "Is this made from GOOSE down or DUCK down? What country did the feathers come from? were they bleached?" "Is there duvet cover for this comforter "
"Are the baffle boxes all the way through?I have a down comforter and the baffle boxes stop about 3 inches from the end and the down has shifted to one end of the blanket." No, the down will shift. Yes, the baffle boxes are all the way. Yes, the baffles are definitely stitched through, and cover the entire comforter. "does this have corner ties to keep it in place in the cover?" No, mine doesn't have them either.